Located on (or should that be under?) Chancery Lane in the City of London, the subterranean complex of underground chambers now known the London Silver Vaults was initially opened by the Chancery Lane Safe Deposit Co in 1876. Originally intended to provide strong rooms for Londoners to store their valuables – things like jewellery, household silver and important documents, the vaults also proved popular with businesses, such as jewellers and diamond and silver dealers from nearby Hatton Garden, both for storage and eventually for selling directly out of. The building above was bomb damaged during World War II and when it was rebuilt, the vaults – at the request of the silver dealers who had previously rented space there – were reconfigured as retail units and re-opened in its current form in 1953. 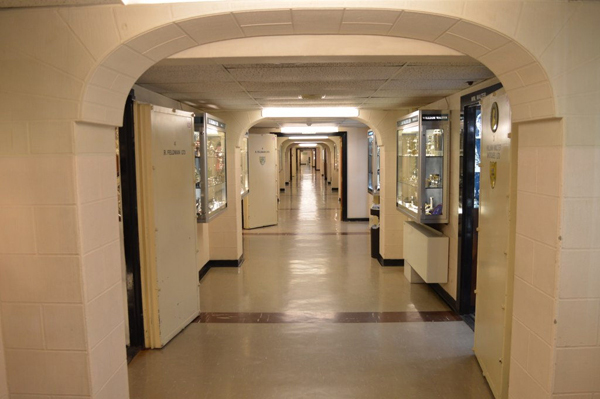 Featuring 3.9 foot (1.2 metre) thick walls, the vaults proved popular among US servicemen who purchased silver to take home to their families, and film and music stars as well as royalty have all apparently shopped here. 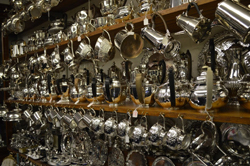 There are just under 30 specialist shops in the complex, claimed to be home to the largest collection of antique silver in the world including everything from cutlery to jewellery and candlesticks. Many of the businesses housed within have been passed down within families. And, according to the management, the vaults have never been burgled. PICTURES: Matt Brown under license CC BY 2.0.